Played by South, 6 is a good contract. 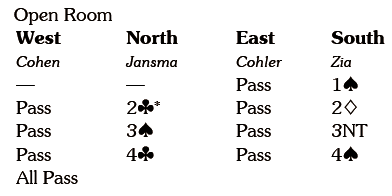 Assuming spades are not 4-0,declarer could ruff a diamond lead in dummy and play a low spade, keeping control. Even with the 4-0 break West still has to lead a minor suit to defeat the slam – here West went for the 5 and declarer won and ran the Q for an effortless 12 tricks. 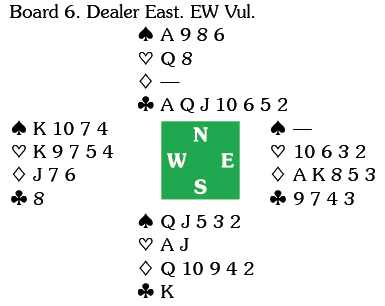 One commentator described it as an unlucky board for NS, with Par being for them to play 6 from the South hand with a lead out of turn (a spade lead from West followed by a heart switch beats 5 ). North had the option of responding 4 at his first turn, which would have promised a void. Another unlucky commentator wrote it would be perverse not to show the clubs, not appreciating that the initial response was artificial. Assuming the bids after North had shown his spade support were control showing, there is a case for West to double 4 . East led the 4 and declarer won in dummy, ruffed a diamond and drew trumps, pitching diamonds from dummy. Our eager commentator opined that East needed to lead a heart to defeat 6 , pointing out that it isn’t easy to do that looking at the AK. That’s spot on, but he then pronounced that even without a heart lead West would be able to defeat the contract by ducking in spades. If at this point declarer lays down the A and then plays a spade to the queen that’s right, although West can also win and exit with a red card. However, declarer had no intention of going down – he played the 8 and put up dummy’s queen, claiming his contract. If West wins declarer can pick up his spades and still has a heart entry to dummy to enjoy the fifth spade and ducking does not help at all. That’s not quite the end of the story. You recall the comment (no doubt tongue in cheek) about South playing in 6 ? West led the 6 (not out of turn) and declarer more or less followed the line already described. 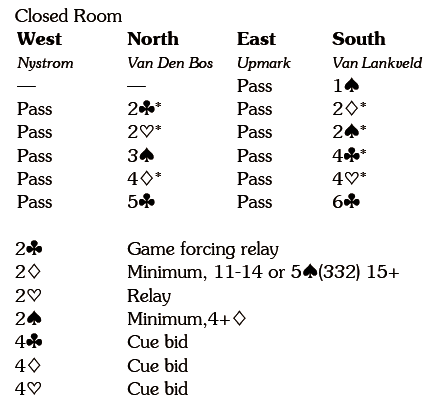 In the other room the auction started 1 -2NT*-3 , but NS played in 6 and West led his club, which meant declarer had no chance. The two declarers featured in this article were the only ones to play in and make 6 . One lucky South made 6 when West lead a heart.